New Seat parts do not have to be expensive, or difficult to buy. 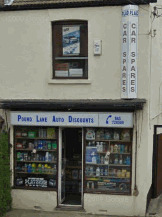 You then will have access to the number one car spares and parts shop in the whole of Essex. Pound Lane Auto Discounts have been the foremost motor shop in Essex since first opening for business way back in 1981. And unlike many of our competitors (and friends) who have unfortunately struggled and closed over the years, we have flourished. And that is not just due to the new Seat parts and spares that we have waiting on our shelves. But really down to the three areas of focus that we believe all our customers deserve from us, and any shop that they visit. "Great Prices - Great Service - Great Range Of Stock"
The list below shows the current range of Seat models that we can supply parts for. All models have a good range of stock either in store, or on our incredibly popular online E-Store. What Do You Do If You Don’t Have The Seat Parts I Want? So if we don't have the Seat motor spares you want, exactly the same as all other models of vehicles that we can cater for, if we haven’t got the part at the time of your visit which is unlikely, we will do everything we can to get it for you. With a history in the industry stretching back over 25 years, we are in contact with all the Seat breakers, or manufactures that can supply us as a priority. However I guess it if fair to say that sometimes we just won’t be able to help provide your Seat parts such as a brake cable for your Seat 850 Spyder (I think we have one of those actually….but we are making a point here), and it's not something we have or can get. But that shouldn’t be a problem either as we have been around the Seat Spares and parts world for over 30 years, and so we can tell you where to go and get it. You may not be our customer the first time you contact us, or the second, but we will do our best to make sure when you need some Seat parts you at least think of Car Spares Essex aka Pound Lane Auto Discount first. You know the best thing to do though, is simply use our online Order form, and we can buy it in ready for you to come and collect. This Sounds Good But Whereabouts Are You Exactly? Pound Lane Auto Discounts are based just outside of Basildon in Essex. But don't think that you will be having to drive your Seat into a town centre or anything like that to get your Seat Parts. We are as easy a drive as you could hope for, as you can see from the map we are literally a stones throw from the three fastest and most direct routes through the county. The A127, A13 and A130 bring you almost to our door, so from anywhere in Essex it should only take you about 20 minutes at the most. For more directions then you can check out our page here. Of if you prefer to get your step by step driving instructions from Google Maps, then use the link below the image and enter your postcode.